By Nick Franssen: The pistol that would eventually become known as the Browning Hi Power pistol started life as the P-35. It was in its final stages of development when its creator, the legendary John Moses Browning, died at the FN plant in Belgium. From there, the pistol was completed by Dieudonne Saive and put into production. 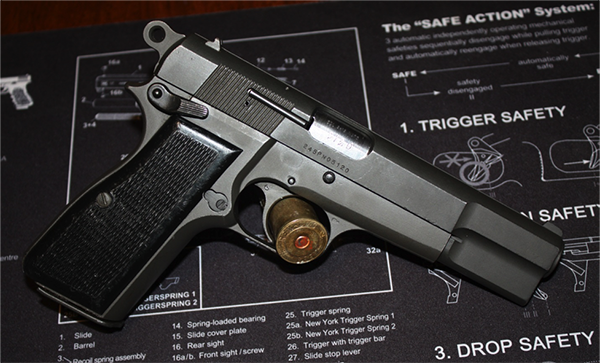 With some examples still in use today as a military sidearm, the Hi Power lives on. As a gunsmith, I’ve worked on a few Hi Powers. There aren’t a lot of them around in my neck of the woods, and even fewer for sale. Those available almost are always some type of special edition or vintage NIB. They’re too expensive for my taste, typically in the $800-$1200 range. They’re also more valuable when left alone. I am not one of those guys. The only queen in my life is my dear wife and she’s not going in the safe. When I decided to buy a Browning Hi Power, Gunbroker revealed that Cole Distributing Inc. of Scottsville, Kentucky had received a large number of examples. They ranged in price from about $325 to $475. Early guns, the MKIIs, and MKIIIs were there for the taking. Some were listed as fair condition shooters. I picked my gun based on features. I wanted a Hi Power with a matched slide and frame, a barrel in very good or better condition, an ambi safety and a ringed hammer. Gunbroker and I have a long history. I look for pictures more than descriptions; “85 percent” does not mean the same thing to everyone. CDI offered an inspection period and hassle-free checkout with credit/debit card payments immediately accepted without an additional fee. Three days later, my firearm arrived. Inside the shipping box: a white, non-descript box with some lettering and a serial number on it. I opened it to find a FN-made Hi Power MKII in surprisingly good shape. My new gun was dark black with a matte hue. The only shine came from where oil was pooling on the surface or the occasional sharp worn edge. There was little finish loss. The frame and slide had matching serial numbers. The barrel didn’t appear original to the gun, however. It was marked 9mm NATO and electro-penciled with the last four numbers of the serial number. The bore was very good to excellent, but I noticed some pitting on the crown. The barrel was definitely fit for a combat pistol, not a match gun. I didn’t notice any other rust or corrosion. The slide-to-frame fit was loose, but typical. The grips were intact and in good shape. It would appear that there’s no such thing as a tight Hi Power, and this gun was no exception. Slide-to-frame fit was as loose as a politician’s morals. When dry firing the pistol, as the sear engaged, the slide moved vertically — if only slightly. Upon closer inspection, my Hi Power may have been a refinished pistol. There were no obvious signs of pitting, but the three-dot sights lacked any sign of paint. The gun was furnished with a Mec-Gar 13-round mag with the same finish. My guess: it was a repark. I was disappointed in not getting a factory Browning magazine, but I didn’t ask about it and it wasn’t a deal breaker. Hi Powers aren’t known for their love of +P ammo, but I didn’t have a lot of options for hollow point gun food. I had the following on hand: 115 gr. FMJ Blazer brass, 124 gr. TMJ Blazer aluminum, 124 gr. +P Speer Gold Dot, 147 gr FMJ flat point American Eagle, and the elusive 147 gr Speer Gold Dot II. All accuracy testing was done at 15 yards standing. I fired singles and doubles at steel targets without issues. I found the trigger to be fairly heavy but not unbearable: about 9 lbs. It was also fairly crisp without a tremendous amount of over travel. Reset is long and not nearly as positive as a GLOCK or 1911. All ammo functioned through the gun without issues. This was one excellent result. I didn’t add any additional lube to the gun, and ran several different types of cartridges. There are stories of early Hi Powers needing to be throated before they’d run hollow points. This one ran them all. All ammo shot fairly consistently. Groups averaged just over 3½” with the occasional flyer (shooter error). As you’d expect, the 124 +P ammo shot the highest, approximately two inches above point of aim at 15 yards. Both 147 gr. loadings were pretty much at point-of-aim, point-of-impact. I’m quite happy with my purchase, as well as the gun’s performance. The Browning Hi Power has a long and distinguished service life. It has graceful lines. It fits the hand well. With 13 rounds of modern 9mm carry ammo, it is a formidable carry gun. With its ease of use and minimal recoil, it’s a blast on the range. Classic John Browning design. The pistol has a lot going for it aesthetically. Though it will always be known as the “other” gun, it’s been used successfully all over the world. Few guns have the romance and following of the Hi Power. The Parkerizing on mine was very good for a used mil surp gun. A little pitting on the crown of the barrel. The magazine appeared either new, or re-parked along with the gun. This is a combat pistol with combat sights. They’re not the 40’s vintage 1911 sights that liberated the FN plant in Belgium, however, and certainly not Novaks. They work, but they’re not easy. The trigger is fairly heavy, but it didn’t seem to matter. The gun shot five different loadings as well as I can with a stock carry gun. Can’t ask for more. This gun fits the hand beautifully and points naturally. It’s substantial, but not heavy, and has easy to reach controls. I have small hands, but can manipulate every function. The ambi safety was worth the extra money. Would be a five star gun with front and back strap checkering. Five different types of ammo with different bullet designs fired without problems. No additional cleaning or lubrication was done after the firearm arrived. Brass ejected consistently, ending up on the ground between 3 and 4 o’clock, right where it should. The magazine locked the slide open every time after the last round. As with the 1911, many parts and upgrades are out there for this fine firearm. I have a set of sights, fancy wood grips, and a spring kit on its way. Classic firearms never go out of style. This one is comfortable and easy to shoot. It’s easy on the hands as well as the eyes. With a solid surplus market, high-quality construction, and fabulous support for custom parts, this is one of the best values out available. While mine was built in 1989, I’d guess we’ll still see Hi Powers around in 2089. I have an Israeli contract FN hi power and its super accurate. Upping the ante with regard to the ‘object in trigger guard for handgun photo session’, looks like some sort of high (all?) brass 12 gauge cartridge. I don’t have a problem with the safety aspect as I’m sure all precautions and checks were made, but to me the object detracts somewhat from the photo of the pistol itself. Anyway, I have always had a soft spot for all metal pistols with a hammer, and the Browning Hi-Power certainly fits the bill! I do miss my WaffenAmt stamped BHP. Truth be told, I liked looking at it more than shooting it. Sorry. That was years ago, and I didn’t have the holster. I got an amazing deal on it, but I don’t have the scratch to really be a collector, so I sold it to fund a more practical purchase. If it’s any consolation, it had AccuRails installed, so it was far from untouched. Yup. Those probably accounted for the low price. Were it not for them, I would have kept it. Of course, were it not for them, I may have not been able to afford it. Hi-Power – gotta’ love ’em! they feel better in the hands (my rather large ones) better than any handgun, including, but not limited to 1911’s, Glock, etc. Also – Mec-Gar makes some of the finest magazines in the world. They actually make “factory” magazines for many many firearms manufacturers. I have owned/do own several Mec-Gar mags. They are MUCH better quality than any “aftermarket” mags I have ever seen and some better than many “factory” mags. First off. Commercial High Powers ARE NOT known for loose slides but some runs of military contract guns built under rushed time contracts did. Advanced gunsmiths have known for years (and kept secret) the fact that slide looseness only accounts for about a 5 per cent drop in accuracy and the High Power is so accurate it has accuracy to spare which still enables it to out shoot with ease most of the econo-grade plasticky trash that is being vomited out by todays factories that claim to be quality gun manufactures. Also your statement that they do not stand up to plus p ammo is pure baloney. Back in the days of the first “plus p” ammo (Lee Juras of Super Vel) I used that very hot ammo and loaded some hotter even than Super Vel ammo, so hot it swelled the empty cases up to the degree that they would not fit in my shell holder for re-loading and none of this hot ammo hurt my High Power. Military ammo is often loaded very hot and in WWII the hot sub machine gun ammo was used in High Powers all the time. As far as sights High Powers have come in a bewildering variety of sights over the years that vary from the almost unusable WWII sights to some very good ones on the Commercial Models. One thing I personally hate like a passion is Novak sights. They are big, bulky and space age looking which look completely out of place on the classic High Power. Note that down through the years the High Power has gone through a lot of changes. The ambidextrous safety levers were unfortunately made out of brittle castings so do not drop a High Power. After 1989 High Powers had the hated and defectively designed passive firing pin safety that left less than a 1/32 inch thick metal on the rear portion of the slide under the firing pin slide stop plate. This results in eventual slide cracking at this point from the repeated blows of the hammer against the slide stop plate and of course dry firing is completely forbidden. After 1984 the gun was made with a cast frame cast internal parts. This was done as a cost saving method because machining a forged super hardened slide would have been too hard on FN’s machinery. 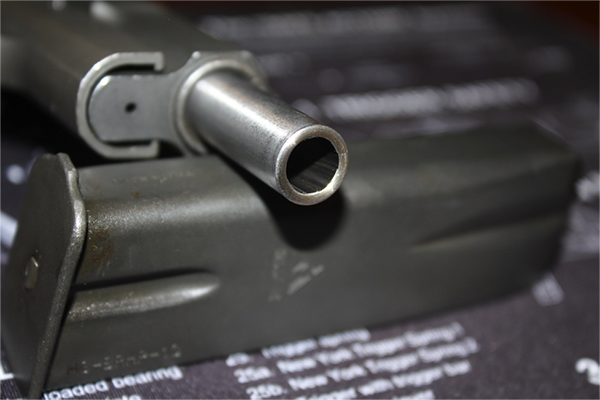 The cast frame was also made thicker to resist the pounding of the .40 S&W cartridge which resulted in a gun that does not feel like the “original High Power” did because the frame is larger in diameter. Sometime after 2001 the High Power lost its barrel hood extension that was designed to stabilized the barrel for consistent barrel lock up and enhanced accuracy. Another move to cheapen the gun. The guns trigger pull does not average 9 lbs like your gun but is usually closer to 7 1/2 lbs and can be lowered to about 6 1/2 pounds by taking out the hated magazine safety. “T and C” series guns made in the 1960’s sometimes came with trigger pulls as light as an astounding 3 1/4 lbs. I still own 3 such High Powers and they will be buried with me. All in all even the cast High Powers being made today look good, and shoot good and when you go to the range people will all want to fondle them and you will hear the usual “oos and ahhs” as compared to people turning green around the gills and vomiting when they see you shoot your “latest and greatest” modern plasticky and stamped sheet metal trash pistol. A note one the 9×19 cartridge. I have taken Whitetail Deer with the old style Remington 125 grain bullet which was not bonded and killed deer with ease with it while the .45 acp cartridge often failed to penetrate sufficiently once the range was beyond 25 yards. Pistolero Magazine in the 1980’s went to Mexico to get around U.S. animal cruelty laws and found that the 9mm and 38 special killed hogs every bit as well as the .45 acp. In 1945 the U.S. Military went into shock when they found out through testing a High Power against a 1911 .45 acp pistol that the .45 acp bounced off of a helmet at a scant 35 yards while the 9×19 penetrated it at an astonishing 125 yards. The German Army adopted the .32 acp over the .380 acp when they found out the .32 acp would penetrate a helmet and the .380 acp would not. Since it has been known since the year 1900 that it is bullet placement and penetration that kill and that bullet diameter is irrelevant it is astonishing that the moronic gun writers of the past as well as those of today still pander the same old balderdash that the 9mm is inferior to the 45 acp or that the .32 acp is a totally worthless, ditto for the .30 Mauser and Tokarev cartridges. I have a decent Canadian Inglis. It has a fiber optic front sight and a Bomar barrel, so hardly original condition. I still like it though. I absolutely love my 1950’s vintage all original Belgium made Hi-Power and am reminded every time I shoot and clean it just how far ahead of his time John Browning was with the one piece ramp design. My HP is accurate and feeds anything as long as I use the two original factory mags, MecGar mags I acquired, and not that p.o.s. ProMag I bought because it was cheap. The feel of a HP is solid & very comfortable because the grip size is relatively small compared to many modern double stack 9’s, however the steel front and back strap will get a tad warm if you run through several mags quickly. My HP was acquired in a trade during my teen years in the 70’s and I actually carried it in condition 3 as an off duty weapon in the early 80’s. As much as I love and wish my HP could be viable for carry purposes, there’s no getting past the fact that any single action semi-auto with no grip safety is considerably less safe to carry in condition 1. For carry purposes the HP is not a wise choice unless it’s the only pistol you own and you have no means of obtaining a 1911 or any modern semi auto pistol such as Glock or Sig that is much more safe to carry. I carried a Browning Highpower cocked and locked on and off duty for a decade plus 5 years without a problem. It’s as safe as your training. Sorry but the Glock and other copy cat pistols that are actually internally cocked and have no manual safety are the most unsafe guns one could possible carry or even just handle. Carrying a Glock is just like carrying a High power with the safety in the off position. Its amazing how few Glock owneres even understand how their guns work. Many Police Departments had so many accidental shootings like New York they either demanded a heavier trigger pull or dropped the Glock altogether for pistols with traditional double action pulls or guns with safeties on them. And lets not forget the totally unsafe takedown procedure of the Glock which requires you to have the slide forward and pull the trigger. An accident waiting to happen if you forget to clear the chamber. This cannot happen with a High Power as the slide must be locked back to take the gun apart. You have linkable sources for any of that? Yes open up that wallet and let the moths fly out and subscribe to “Gun Mag” (formerly Gun Week). Since the 1980’s when the Glock first came out they have published untold numbers of accidental shootings with the Glock including not only Police Departments but Civilian deaths as well. Also most of the other Gun Magazines have done the same. Just this summer one of the Gun mags, If I remember correctly it was either Gun World or Guns that ran a story of a Cop who got out of his car, stumbled and accidentally shot a innocent person sitting in the passengers seat of a car he had only stopped for a minor traffic violation. Just one of many such tragic stories concerning the unsafe Glock. I could write you an entire page of such shootings I have read about over the years just from memory alone. It is tragic that Guns are the only product that is not covered under the Consumer Safety Laws in this country. As a matter of fact it is insane. If this were not the case Glock would have to put a manual safety on or go out of business. The Massachusetts Attorney General is currently in court with Glock over confiscating their records to prove how many people were shot and sued them over the unsafe design. I forgot to mention the unsafe takedown system that has also contributed to many needless maiming’s and deaths as well. The Moron that designed the take down system must have been a Chimpanzee that took the engineering job to design the take down system because he was not intelligent enough to work in a zoo. You must actually have the slide forward and then pull the trigger to take down the gun. Forget just one time to check the chamber and you end up shooting yourself or worse some innocent bystander. Now contrast this with the Beretta 92 take down system which requires you to pull back and lock the slide when taking down the pistol, even if you do forget to take a round out of the chamber it comes flying out when you lock back the slide. With its manual safety and long hard double action pull it is light years a safer gun to handle and use. Even the Ancient HIgh Power requires you to jack back the slide when taking it down. Cisco you’re obviously ignorant on the mechanics of modern striker fired pistols like the Glock. I am now going to explain how the Glock works so that even a computer person like you can understand this. The pre loader striker fired systems are internally cocked. The are not fully cocked but this is of no consequence as when the trigger is accidentally snagged the gun behaves exactly like a single action gun, in other words it goes bang right now. The trigger travel is so close to a single action it is of no consequence to even speak about. Now I cannot make it any more simple than that. Now would anyone carry a revolver with the hammer cocked back in their waist band without a hard shell holster or a single action automatic with the safety off in the same way. Again I have proven that you and many Glock owners do not understand how a Glock works because it does not have a visible hammer like the revolver or hammer fired auto pistol and what people cannot see they do not fear even when the danger is waiting there to kill them in a Nano second. It reminds me of the Russian workers who thought that radiation would not kill them when they cleaned up the Chernobyl power plant that blew up. They found out differently far too late. So it goes with Glock owners as well, until it is too late. I have four and a half Hi-Powers. 1. WWII Nazi Tangent Sight with original magazines and holster. Made without the slot for the shoulder stock. 2. Mid 80s production Brushed Nickle. 1/2. Argentine FM Detective Slide assembly that I pair with the .40 S&W gun. Love ’em all. Great pistols. It looks just like the refurb units AIM Surplus is selling, with the black oxide finish. I wonder where they’re coming from. Canada? I’m debating between this and a Browning BDM. I bought one of their higher-priced ones a while back, and then replaced most of the springs and the grips myself, and had a smith replace the sights and remove the mag-disconnect safety (yes, in theory I should have been able to do the safety myself – in practice it wasn’t happening). Anyway, for about $750 into the project I’ve got a Hi-Power I like, with better grips and sights than a brand new $1,100 gun. I’m quite pleased. I had me one, and I hope the TTAG ‘Armed Intelligentia’ can help me identify it. It appeared to be roughly 70’s manufacture, excellent manufacture quality, very ‘slick’ action when cycling it. Very little ‘slop’ in it. To this day, it is the softest shooting 9mm I have ever shot. Now here’s the weird part: I can’t recall *exactly*, but it wasn’t stamped “High-Power”, it was something slightly different, like “Hi-Powr”, it was missing one letter, the ‘e’ if memory serves. Has anyone ever seen one stamped “Hi-Powr”, or similar? I have some vague memories of it being an object of desire back in the ’80s. St. Ronnie hadn’t yet taken away our ability to buy new auto-guns, so other guns took precedence. It wasn’t the Gold, so it must have been the ‘Classic’. I bought from a pawn shop I was at at the time, for $350. Sold it during my fiscal collapse 5 years later for $400. And now I discover it was worth several times that. The first pistols I ever shot were issued Hi Powers using very hot sub machine gun ammunition in the Australian Army in the 1970’s. We were still using them when I left in the 90’s. I believe many units especially reserve ones still use them. Trigger was heavy and I never used a gauge to measure but felt heavier in single action than my privately owned Tanfoglio that I bought before I left army. Tanfoglio is 8 pounds double and 3 single. Frame fit was good and sights basic but it worked every time. I would have one to use at range but not for every day use unless the trigger and sights were upgraded. But I have modern pistols for that. AFAIK, the Canadian Army is still using them. They’re nice and shiny because all he bluing has worn off. We used to joke that they still had grit from the Normandy beaches in the grips. Apparently MPs and pilots have now been issued Sig P226s, but the rest of the Canadian Armed Forces still have WW II Hi-Powers. This is because Colt Canada is the CF’s sole-source for small arms and nobody will license them a decent, modern pistol design. An interesting note is that the pistol should never have been called the Browning High Power but rather the Dieudonné Saive High Power. The Browning gun was a huge striker fired weapon and about the only thing Saive borrowed from the Browning gun was the double column magazine. Its a shame that the 16 round magazine was done away with for the less capacity 13 round that the French wanted. Then after Saive gave them this they still rejected the gun. Thank you, thank you for beating me to the punch on this garbage about who is the true father of the Hi power. As a former user, the myth about JMB & the P35 is only topped by the .30 Carbine myth. Saive deserves the true credit. thanks for helping end this JMB designing the P35 garbage. Every time I hear the lie repeated I have the same reaction. Saive deserves true credit. A great movie scene has Sean Connery doing some good work with a High Power in “A Bridge Too Far”. Supposedly taken from history – but wait, I thought that soldiers never actually shot anybody but themselves with pistols. Once removed the trigger will be slightly smoother, and a good 2-3 lbs lighter. My Argie Hi-power definitely needs full pressure loads to function. With standard pressure commercial loads I often get failures to extract/eject. Great article. I had a FEG knock off back in the day ( about 20 years ago) that I bought at Hornicks in Johnstown for $250. Never had a problem of any kind. I wish I would have held on to that one. Still have mine and I’ll never get rid of it. It’s fed everything I’ve ever fed it flawlessly- no malfunctions (yet). I’m assuming I’ll have one eventually, it’s only been 20 years. It’s as accurate as I am, so I can’t complain. Although I’ve seen it described as a Hi-Power knockoff, given that it is DA/SA with a decock lever I’ve always wondered how different the internals are from an actual Hi-Power. Never had the opportunity to compare. For the better part of a century this was arguably the “best” (loaded phrase I know) full-size handgun you could get. If I had to choose between this and any service pistol or revolver up until the 80’s I could only see going w/ a TT-33 over this just for the penetrative power of the Tok cartridge. 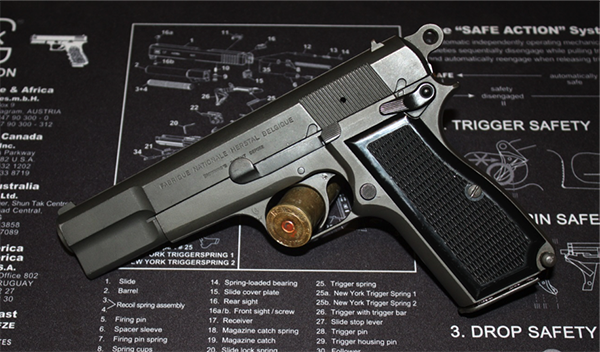 This beats the TT-33 in every other way and most other handguns as well. It was ahead of its time. I am a bit late to the Israeli surplus Browning Hi Power party, but I did take delivery of one Thursday 11/17, purchased on Gunbroker from Mach I Arsenal in Knoxville, TN. Mine was listed in “fair” condition. Instead of being blued, it is black, probably some sort of enamel paint. It has a spur hammer, fixed three-dot sights, plastic grips, and a lanyard ring. There was no pitting on the barrel, but I did give it a good scrubbing with J-B bore butter, and I gave the whole rig what I thought was a pretty good cleaning. There was quite a bit of wear on the slide. The paint on the right rear, near the rear sights, was completely worn off, and there was a bit of pitting. Also, no paint or bluing on the slide release, with a bit of pitting there. Otherwise just typical long term holster wear. Inside, it looked just fine. I got the Dremel out and polished up the feed ramp. I then took it to the range and put 200 rounds of Winchester White Box through it. I’m not a particularly accomplished shooter, but by the end of the session, I put three magazines through my last target at 10 yards, with fairly rapid fire, and made a 3 inch hole in the thing. When they say “shoots to point of aim,” they’re really on the money with this machine. This is one substantial gun, and that tamps down on the recoil, for sure. The next afternoon I decided to investigate. I poked around in the easily accessible trigger mechanism and, lo and behold, found enough black sludge and grit to convince me this gun had been in an Israeli sandstorm. After about an hour of plenty of Hoppe’s #9, q-tips, and itty-bitty patches, and digging gunk out with an ice pick I declared a truce and put it back together. I’ve only dry fired it since, but I definitely got the grit out. I’ll try to find the reset, if it has one, the next time at the range. My only complaint about this firearm is that it doesn’t have a trigger as nice as a 1911. But, then, what does? I may get some trigger work done on it, but then that would take it out of the “budget shooter” department. I highly recommend getting one of these while the supplies last. I forgot to mention — the slide to frame fit is perfect. Slick as can be, and no rattle at all. I have a 1978 Browning HiPower with adjustable sights made in Belgium that my dad bought new, which still has the original mag and the zippered gun pouch it came with. I was there when he bought it – so it’s not a surplus gun.. It has rested in his night stand until he passed about 7 years ago. This gun is beautiful and has about 99% of its finish remaining but I’ve noticed it is beginning to show a slight patina in certain spots. Aesthetically, I think there are very few pistols that come close to the beauty of a HiPower. I’ve taken it out and shot it several times since acquiring it and it is a natural pointer. My 13 year old son who has limited experience shooting such weapons could hit every target spot at 15 yards with ease. Seriously, these pistols are amazing to shoot and I’ve been really considering making it my carry gun. The one thing I don’t like about the HiPower is the magazine “safety” meaning it won’t fire unless a magazine is in it. I eventually decided to have it removed along with the very short safety lever on the left side. One benefit to removing the magazine safety is that it lightened the trigger pull and adding and extended safety made it more practical for carry. It also drops the magazines more reliably now. I also added some nice Hogue custom wood grips (I’ve saved all the original parts). To be honest, this pistol is my favorite to shoot – it’s very controllable and is simply a natural pointer (yes, I like it over my 1911’s, which shocks even me to say). I asked a gunsmith friend about refinishing it with some sort of new coating such as NiB. He looked at me with surprise and strongly recommended against it due to collector value. The point is – I don’t own any “safe queens” either – to include the custom Colt 1911 my Army unit special ordered from Colt while we were in Afghanistan (once I brought myself to shooting that first round it got easier). Bottom line: The HiPower is an amazing pistol that few match in beauty, accuracy and ease of shooting. If you don’t have one – buy one. I still haven’t decided about refinishing it, maybe never will. One last thing – I’ve NEVER had a malfunction with this pistol and as someone else pointed out, Removing the magazine “safety” really makes a difference in the trigger pull. Much nicer and lighter. Outstanding information here on the Browning Hi Power! / DMD and Cisco Kid, thanks for sharing your knowledge on the Hi – Power.